Jeanne Mance Park in the foreground, with Mount Royal in the background. Jeanne Mance Park (French: Parc Jeanne-Mance), formerly known as Fletcher's Field (French: Champ de Fletcher), is an urban park in Montreal's Plateau Mont-Royal borough. Named after the co-founder of Montreal, Jeanne Mance, the park is located along Park Avenue, opposite Mount Royal, and just south of Mount Royal Avenue. The park was previously known as Fletcher's Field. According to local tradition, the park was named after one Fletcher, who lived on the outskirts of the grounds and pastured his cows there. The history of the park began at the end of the 19th century with the planning of Mount Royal Park and the city's acquisition of land on Mount Royal, which ran from the summit of the mountain to Esplanade Avenue, between Pine Avenue and Mount Royal Avenue. In 1878, Montreal's Crystal Palace was relocated to Fletcher's Field. The structure was destroyed by fire in July 1896. In 1879, Fletcher's Field was identified by the Pharmaceutical Society of Great Britain as a notable source of Hyoscyamus niger, a psychoactive plant. The park used as a military parade ground, as was Logan's Farm (now part of La Fontaine Park). During the Great War, troops were trained on Fletcher's Field. 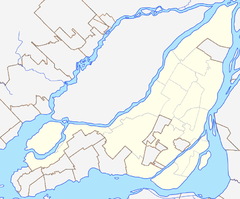 The Montreal Lacrosse Club and Royal Montreal Golf Club (as well as youth lacrosse and football clubs) also used Fletcher's Field. In September 1910, during the Montreal Eucharistic Congress, there was a campaign to rename the park in recognition of the founder of the Hôtel-Dieu de Montréal. The city of Montreal officially changed the name of the park to Jeanne Mance Park in 1990. The plaza entrance of Jeanne Mance Park opposite the Sir George-Étienne Cartier Monument is affectionately known as Place Fletcher's Field, serving as a reminder of the park's former name. The park features playgrounds, two softball fields, courts, a soccer field, a children's swimming pool (in the summer) and outdoor skating rinks (in the winter). An Art Deco drinking fountain with an inscription in honour of Louis Rubenstein is located at the corner of Mount Royal Avenue and Park Avenue. Public washrooms beneath Place Fletcher's Field, the plaza opposite the Sir George-Étienne Cartier Monument on Park Avenue. ^ a b "Parc Jeanne-Mance". Ville de Montréal. Retrieved 12 October 2015. ^ Deschambault, Gabriel (26 March 2015). "On fête à Fletcher's field". Histoire du Plateau Mont-Royal (in French). Retrieved 5 November 2018. ^ Noakes, Taylor (19 April 2016). "Expo 1881". taylornoakes.com. Retrieved 5 November 2018. ^ Colombo, John Robert (June 1984). Canadian literary landmarks. Hounslow Press. p. 72. ISBN 0-88882-073-9. ^ a b "Fletcher's Field". The Gazette. 161 (164). Montreal. 11 July 1927. p. 12. ^ Claypole, E. W. (22 November 1879). "The Migration of Plants from Europe to America, With an Attempt to Explain Certain Phenomena Connected Therewith". Pharmaceutical Journal and Transactions. Pharmaceutical Society of Great Britain: 405–406. This page was last edited on 7 November 2018, at 03:24 (UTC).